Panticapaeum (Ancient Greek: Παντικάπαιον, translit. Pantikápaion) was an ancient Greek city on the eastern shore of Crimea, which the Greeks called Taurica. The city was built on Mount Mithridat, a hill on the western side of the Cimmerian Bosporus. It was founded by Milesians in the late 7th or early 6th century BC. The ruins of the site are now located in the modern city Kerch. The prytaneion of Panticapaeum, second century BC. Kerch's Obelisk of Glory is visible in the background. A coin from Panticapaeum, bearing a star inside a diadem and the letters "ΠΑΝ", 2nd century BC. During the first centuries of the city's existence, imported Greek articles predominated: pottery (see Kerch Style), terracottas, and metal objects, probably from workshops in Rhodes, Corinth, Samos, and Athens. Local production, imitated from the models, was carried on at the same time. Athens manufactured a special type of bowl for the city, known as Kerch ware. Local potters imitated the Hellenistic bowls known as the Gnathia style as well as relief wares—Megarian bowls. The city minted silver coins from the 5th century BC and gold and bronze coins from the 4th century BC. At its greatest extent it occupied 100 hectares (250 acres). The Hermitage and Kerch Museums contain material from the site, which is still being excavated. In the 5th–4th centuries BC, the city became the residence first of the Archaeanactids and then of the Spartocids, dynasties of Thracian kings of Bosporus, and was hence itself sometimes called Bosporus. Its economic decline in the 4th–3rd centuries BC was the result of the Sarmatian conquest of the steppes and the growing competition of Egyptian grain. 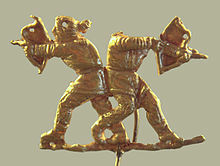 Small statue of Scythians with bows from Panticapeum, fourth century BC. The last of the Spartocids, Paerisades V, apparently left his realm to Mithridates VI Eupator, king of Pontus. This transition was arranged by one of Mithridates's generals, Diophantus, who earlier had been sent to Taurica to help local Greek cities against Palacus of Lesser Scythia. The mission did not go smoothly: Paerisades was murdered by Scythians led by Saumacus, and Diophantus escaped to return later with reinforcements to suppress the revolt (c. 110 BC). Half of a century later, Mithridates took his life in Panticapaeum, when, after his defeat in a war against Rome, his son and heir Pharnaces and citizens of Panticapaeum turned against him. ^ "Panticapaeum". Internet Encyclopedia of Ukraine. Canadian Institute of Ukrainian Studies. Retrieved 18 February 2013. Noonan, Thomas S. (1973). "The Origins of the Greek Colony at Panticapaeum". American Journal of Archaeology. 77 (1): 77–81. doi:10.2307/503240. JSTOR 503240. Treister, Michail Ju. (1990). "A Matrix from Panticapaeum". The Journal of the Walters Art Gallery. 48: 29–35. JSTOR 20169058. Tsetskhladze, Gocha R. (1997). "A Survey of the Major Urban Settlements in the Kimmerian Bosporos (With a Discussion of Their Status as Poleis)". In Nielsen, Thomas Heine. Yet More Studies in the Ancient Greek Polis. Historia Einzelschriften. 117. Stuttgart: Franz Steiner Verlag. pp. 39–82. ISBN 9783515072229. Wikimedia Commons has media related to Panticapaeum.